The Design Team enjoyed a high-profile invitation to the Scottish Parliament earlier this week. As long-term supporters of Show Racism the Red Card's Creative Competition, we were asked to represent the College at SRtRC's 'Showcase Event', which took place last night in the Garden Lobby at Holyrood. Show Racism the Red Card is sponsored by the Scottish Government, SQA, Scottish Football League (SPL and SFL), Unison, Unite, Education Scotland, EIS and the Scottish Football Association (SFA), and their creative award is an annual competition open to schools and FE colleges across the country. As well as showing off some of our previous work, including winning entries in 2010 and 2011, Design Tutor Chris Hughes and our finalist from last year, Mark Phillips, both gave short talks on the college's involvement in the award. 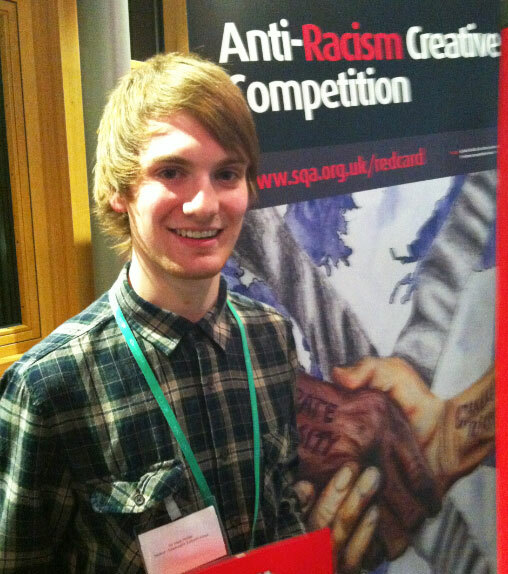 Pictured at Holyrood - 2012 Creative Award Finalist Mark Phillips, HND Graphics. Read more about the event at Show Racism the Red Card, Showcase Event, 2013.